Phew. Where has the week gone? I’ve been trying to finish this post for days and days. Swamped I tell you, with the regular routine, an essay for a book Power of Moms is putting out, some editing for Segullah, a party to plan for two little girls about to turn four, a husband who is working late nights (miss him I do) and well, I’m just tired. Madeleine L’Engle called her thirties “the tired thirties.” She just couldn’t shake it. Boy, do I find that comforting. Even wise, ardent, articulate Madeleine felt tired during this decade. So it’s after 10 PM and I am tired but determined to finish this post! Yes, that’s the sign of a good book. I like to lose myself in other people’s minds, visit new places, learn something new, drink words. Words matter, and good words that let the light in, help me think, feel – they take me to the brink and back. And who doesn’t love a good story? So here’s what I’ve been unable to put down the last few weeks. 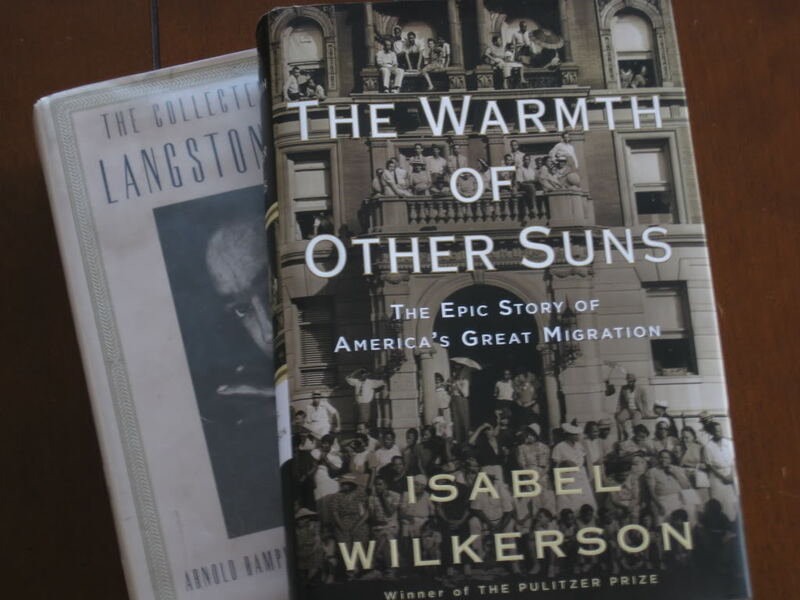 The Warmth of Other Suns by Isabel Wilkerson. This best-seller recounts the history of the Black Migration out of the South (1920’s – 1960’s). Wilkerson was the first black woman to win a Pulitzer for journalism and this is her first book. She’s a stunning writer. Her book details the life of three individuals – two men and one women – who left. Reading of their oppression under Jim Crow laws left me aghast. I knew some. But not this much. And I am ashamed it happened in our country. The fear, the atrocities, the lack of courage and compassion. It’s a must-read. Top of my list for the year. ps – Wilkerson’s book also moved me to pick up Langston Hugh’s Collected Poems at the library, just to peruse. Oh my, I am smitten. Mitten Strings For God by Katrina Kenison. This was my first read of the year. It is referenced in nearly every mothering book I’ve read, so I was dying to know – who is Katrina Kenison? Well, she writes great stuff. Authentic? Can’t say I was always convinced. But I did a fair amount of underlining. There are definitely some beautiful thoughts here about motherhood and Kenison has influenced how I parent in a positive way. Still Alice by Lisa Genova. All I can say is wow. If you know someone with Alzheimer’s, this novel may strike a little too close to home. But Genova’s story of a female Harvard professor diagnosed with early-onset Alzheimer’s in her forties, is tragic, life-changing, and inspiring – all in one read. Genova has her PhD in neuroscience and helps readers understand the progression of the disease from both a patient and caretaker’s perspective. I realized both are grueling places to be. I’m looking forward to picking up Genova’s newest book, Left Neglected. Bird by Bird by Anne Lamott. Ah… loved, loved, loved this one. Ann Lamott is funny – I mean sidesplittingly funny. I did find her a little affronting at first (like – wow – did she just say that?) but once I got to know her, I realized she is a voice to be trusted when it comes to writing advice. Every writer ought to read Anne. She is phenomenal. Two-Part Invention by Madeleine L’Engle. Just looking at the covers of these two books calms me. L’Engle’s words are smooth, peaceful, life-giving. You can’t go wrong with any of her Crosswicks journals. Two-Part Invention is about L’Engle’s marriage to the actor, Hugh Franklin. Their commitment to each other over a lifetime, especially during Hugh’s final days, is tender, beautiful, and selfless. This one made me love my husband more. A Circle of Quiet by Madeleine L’Engle. Here you’ll find more of L’Engle’s prose about making space for the quiet, for finding yourself, and using nature and people as places of renewal. She wrote this in her forties, after getting through the “tired thirties” and I’m thinking she wrote it for mums like me – in the thick of tired. L’Engle is a Christian writer and self-made philosopher. She is charmingly frank, honest about everything, and illuminating – always. The Maytrees by Annie Dillard. My opinion? Best novel of the year. Every word is essential, poetic, metaphored. Through the telling of this unpredictable love story between Lou and Toby Maytree, Dillard teaches us about human nature, the human landscape, and unlikely journeys of the soul. I think it is Dillard’s most intriguing work. She never says much about herself – it’s hard to find a good bio on her. But she has said, “The way to know about a writer is to read the texts.” I believe The Maytrees is a look right into her soul. Hunger Games and Catching Fire by Suzanne Collins. I read these at the beginning of the year as well. It was so nice to jump into something easy – to fly pages and find myself sneaking into the bathroom to steal a chapter. My grandmother said, some things you do because “your IQ demands it.” And that’s how I felt about Collins’ books. I had to know what the buzz was all about. And I wasn’t disappointed. Thanks to my good friend Brodi, whose YA novel was recently picked up by HarperCollins, I’ve been more aware of this genre. I haven’t read Mockingjay yet, but it’s on the list. Mormon Women: Portraits and Conversations by James Kimball and Kent Miles. I reviewed this one for Meridian but can’t find it archived there since they revamped their site. I will tell you though, that these interviews with diverse Mormon women around the world are riveting. These women tell their own life stories in first person. They talk about their unique life path and how God has been a part of it. I read this before being involved with the Mormon Women Project. The concept is very similar and both are inspiring. This book changed my life. Ennobling, empowering, and for every woman – even if you are not LDS. Dance with Them edited by Kathryn Soper. I reviewed this book for Mother’s Day last year on Meridian. It’s a compilation of essays and poetry written by thirty women at Segullah. These are women who write from experience and from the heart. Their honesty will help any mom negotiate the challenge of mothering school-age children. Mothering is like an intricate dance – unique as our individual children, and just as we’re getting our footing, the rhythm shifts. But I love the metaphor of the book: It’s not a tug-of-war. It’s a dance. What about you? Tell me your favorite reads from 2010. And while we’re on the subject, the link in the nav bar titled “The Books” is a place for you to find old book reviews, book lists I’ve posted, and whatever I’ve currently got my nose in. I hope you can visit your favorite “sequestered nook” this weekend. Cath-thanks for this list. I'm always looking for a good book to read, but don't know where to start. I've wasted time on lame books and I hate that feeling of getting to the end of a book and thinking, "that was a waste of my time." I don't have the luxury of wasting time…..I'm a mom of young children:) Where do you get your books? Library, Amazon?? Requesting a few from the library…thanks for the list! Michelle – I understand completely! Time's too precious. When I want to buy, I definitely use Amazon. It's cheaper and with Amazon Mom you can get two-day free shipping. If I'm not sure I want to buy I use the library system. I case out the NYT best-seller lists as well as talking with friends who have similar reading tastes. Sarah – Noticed you were reading Guernsey Literary Potato Peel Pie Society. Loved that book. Did you enjoy it? I find reading far too dangerous – I start late at night and Im never disciplined enough to put it down. It gets my mind racing and if its good I literally cant help myself, I have to read it till its DONE. Maybe when the boys are a little older and at school and I can read in the day and school run can be my reading curfew! The worst part is that you've tempted me, there are at least two on this list Im going to have to just get my hands on!! Cath – while living in England I have been deep into old English novels and history, I can't help myself when every time I look around I think of Jane Austen or Charles Dickens. So this year I re-read Wuthering Heights, read Little Dorrit by Charles Dickens for the first time, and am currently reading a biography called "The Six Wives of Henry VIII" by Alison Weir. I have read some fun books too, the one that was fun, but filled my English need was Bill Bryon's At Home. He is always so full of information, and this time he referenced several places local to me. Very fun. Cristie – I'd love to see your list! Renwicks – Yes, you have to pick your poison carefully and at the right time! I'm a night owl like you. It's the only time I have to read. Shells – I'd be reading Austen and Dickens too, if I were you! You lucky girl. I've thumbed through Bryon's At Home. Loved the concept. You would recommend it then? I would recommend it, but I do think part of the enjoyment came from living in the area he was describing. The book isn't entirely based in England, but the house he uses to frame the discussion is here, and many of the historical figures/facts are from here. How he finds and weaves together hundreds of random, interesting, and crazy facts always impresses me. I also forgot to mention a book I finished recently that made me think of you. The Lost Books of the Odyssey: A Novel by Zachary Mason. Very short chapters, re-telling the stories of the Odyssey in completely new, interesting ways. A very well done book and easy to read a few minutes at a time when you are in between things. This year I read all of Sandra Dallas' books. Her most famous book is probably, "The Persian Pickle Club" but I like all of them. Depending on the book you get to visit depression era, Japanese interns during WWII, and she frequently revisits the time of Colorado's gold rush and small mining communities. Dallas is all about good principles, strong families, strong friendships, loyalty and sigh, Happily Ever After. But never cheesy. She submits to readers a real, tangible version of happily ever after and I can't get enough of her! Bird by Bird is one of the reasons I started writing my book! I love that little book so much. And I'm glad you are delving into the YA genre a little bit. The best books can be found there. I might be biased. I just read Half-Broke Horses and really liked it. Have you got A Thousand Gifts yet from aholyexperience.com? I'm enjoying it. I just finished Olive Kitteridge…see my semi-review on my blog. I'm starting Blink again and am reading Now They Call Me Infidel for my bookgroups. There is a great part of me, however, that just wants to only read spiritual books. Maybe I'm moving into a new phase. I'm going to check out Bird by Bird. I love Anne. i was so happy to see your review of books. i love to have some recommendations from someone i trust. i read 'mitten strings for god' years ago. i remember loving in many ways, but feeling much the same as you in the sense that her life seemed a bit charmed. being able to do the things she did was made possible by her circumstances. still i very much enjoyed the thoughts and stirrings it brought to me at that time of my life. i may need to read it again. i actually JUST finished 'still alice' last week. i haven't been able to stop thinking about it. so many things to digest…especially because memory disorders run in my family. heartbreaking. i really enjoyed the hunger games series, but the interest faded for me with each book. no YA fiction has yet to live up to harry potter for me…tall order i know. thanks again for the list and your eloquent thoughts. Yay! I'm loving all the recommendations. Shells – Lost Books of the Odyssey sound fascinating. Lauren – I admit I've never heard of Sandra Dallas. But I would trust your opinion. Sounds good. "Not cheesy" – that convinced me. Brodi – you're the reason I read Bird by Bird. Thank you! And yes, you're biased. But that's okay. I just borrowed Ally's book, Matched. Looking forward to it. Melonie – Oh I've been salivating over Ann Voskamp's book. (Do you read Holy Experience too?) Her words move me deeply and I've been meaning to get on Amazon and buy it. So glad to hear you're liking it. How could you not? I understand feeling pulled toward the spiritual. Certain seasons of life are like that. Especially when most of us have such limited time to read. Kara – you are the one waxing eloquent my dear. You pinned down my disconnect with Kenison perfectly. I guess I felt five in four years was just so different from her two (and her ability to still work, edit, write a book). There were moments I just couldn't relate. But I still loved it. And I agree, who can beat Harry Potter?